iAssociate 2: Test your knowledge and vocabulary in this fantastic word association game. Rating: 4/5 A fantastic game which is fun to enjoy in a group, in couples, or by yourself. It’s unique, interesting and educational all at once... it could even help someone with out-of-the-box thinking and improve creativity! There's no reason why you shouldn’t download this free title and give it a whirl. iAssociate 2: Test your knowledge and vocabulary in this fantastic word association game. 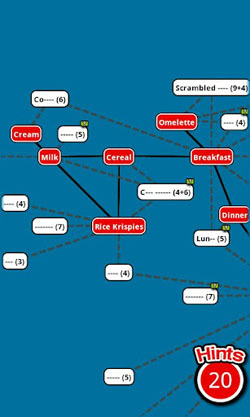 Gameplay: iAssociate 2 is a word association game. 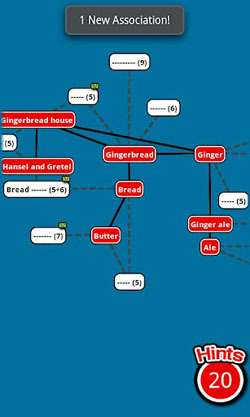 You start each level with one word in the middle of your board and from this node you have dashed lines coming out creating a sort of star diagram. At the end of each connection there’s a white box and your aim is to guess words to fill into the boxes. They’ll be associated to other words which they have a connecting line to… hence the name of the game. As you fill in your boxes, more associations appear for you to solve. There’s no time limit on solving each level’s puzzle, so you can stop the game and then come back to play when you’re free to think about it again. In case you think it’s totally in the dark guess work, there’s a number which shows you how many letters are in the word and there are free description hints for selected boxes. If you’re really stuck you can use a hint which will uncover the first unknown letter in your word (… or you can check out our hints and tips). You’re given about twenty clues for free per round, but you can buy more with real cash if you need help. Ten levels come for free and the rest need to be purchased with tokens. But apparently it’s possible to get the whole game for free (on iOS) without paying a cent – you just need to follow the instructions on how to get the free tokens. Game Feel: Warning… be careful… this is an addictive game… bizarrely addictive. For some reason I just felt the urge to uncover all the words and complete all the network diagrams. Part of the desire to play is also because the word associations are funny. Not necessarily laugh out loud material but they make you think and remind you that some words have double meanings. The simplicity of it all just makes it so easy and approachable for everyone. Those people who want to improve their English can benefit from learning new words and understanding associations. Then the competitive players feel the urge to not let a straightforward game get the better of them! Not only that, but this game can be played by groups and couples… especially when one person gets stuck. Graphics, music and sound effects: Ummm… on the scale of normal games… this has diddly squat… but then this isn’t that sort of game. No music or sound effects are necessary because you can spend such a long time playing…. you should have your own music in the background so that you can have variety. Graphics-wise the setup is clean and lightweight. On the more positive side of things, this means that any flavour of Android OS should be able to run this game. However, I think they could have done something to give a little bit more eye candy. How does it compare to the iOS version? It seems very similar… almost identical. Even the interface is very iPhone like because the back button doesn’t even work, and you need to kill the process every time you want to stop the game. The one thing which I think seems totally different is the level pricing structure. It doesn’t seem like it’s possible to get everything for free and I suspect eventually one would have to pay for tokens to buy levels. Each round gives you some free hints and they don’t transfer between levels so you may as well use them. Don’t expend them all at once though. Pace yourself and use the total solve percentage to spread your hints. Instead of using the in game hints, you can ‘like’ iAssociate on Facebook and find hints from there. The game will uncover the leftmost character which you guess correctly. This means you can do an alphabet brute force hack and uncover each letter systematically until you can guess the word. Remember if you’re using the alphabet solve method that you should usually try the vowels first after you uncover a consonant. i am totally addicted to this game! i have it on my android phone and ipod! Yeah it is a pretty good game indeed. Apparently it’s possible to get the whole game for free on the ipod. Not entirely sure how though… because the Android one can’t be obtained just through clicking on the sponsors.